If you’re ready to cut way back on the sweet stuff, sign up for our 14-Day Sugar Detox! The challenge kicks off Monday. Some of my clients think drinking lemonade is good for them, since lemons are full of vitamin C. But the sugar used to sweeten the bitter juice can add up quickly: A 16-ounce bottle of Hubert’s, for example, contains two servings, each with 14 grams of sugar. Down the whole bottle (which is easy to do on a sweltering day) and you get 28 grams of sugar. Water down pre-made lemonade to curb your sugar intake. Or, make your own with some fresh-squeezed juice, H2O, and a tiny bit of raw, organic honey. It can be tricky to judge the sugar content of a blueberry muffin. That’s because the Nutrition Facts label doesn’t distinguish between naturally-occurring sugar—from an ingredient like blueberries—and added sugar, the kind you’re trying to limit. (That distinction is coming by 2020 however! And some manufacturers have already stated updating their labels.) The best way to gauge the added sugar content (for now) is to look at both the grams of sugar and the ingredients list. Unsweetened yogurt plus fruit is generally a smart choice. But at some fast food places, you have to watch out for extra sweeteners. 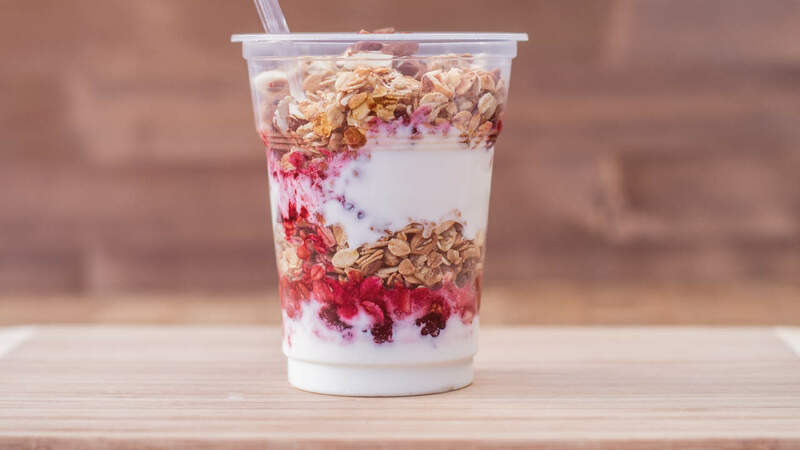 For example, scan the ingredient list on Panera Bread’s Greek Yogurt With Mixed Berries Parfait, and you’ll find five different types of added sugars (including molasses, brown sugar, and maple syrup). While the berries contribute some naturally-occurring sugar, added sugar is likely a large chunk of the total 30 grams. Instead, choose Panera’s Steel Cut Oatmeal With Almonds, Quinoa, and Honey, which contains just 7 grams of sugar. You probably don’t think of tomato soup as sweet. But scan the label, and the second ingredient (after tomato puree) may well be high-fructose corn syrup. Take everyone’s childhood favorite, Campbell’s condensed tomato soup: One can contains 30 grams of sugar. To rein that in, stick with the serving size listed on the label—just a half cup—which contains 12 grams of sugar. And stir in some veggies, like chopped spinach or shredded zucchini, to pump up the volume and add extra nutrients. It’s obvious that the sugary types of cereal aren’t as healthful as the hearty, whole grain varieties. But if cereal is your go-to sweet treat, you may be surprised by just how much sugar you can rack up in a generous sized bowl. A three-quarters cup serving (think three quarters of a baseball) of Honey Smacks, for example, contains 16 grams of sugar. If you fill up your bowl with double that portion, you’ll down 32 grams—the amount in almost 30 gummy bears. A slushy cocktail goes down so easy. But beware: it can readily pack over a day’s worth of added sugar. Chili’s Ultimate Fresh Margarita contains a whopping 40 grams (the amount in about 40 jelly beans!). To celebrate with less sugar, opt for a glass of red wine (which has 1 gram of sugar per 6 ounces) or a light beer (3 grams of sugar per 12-ounce bottle). That way you’ll save some sugar grams for a bite or two of a shared dessert, or a few squares of dark chocolate after your meal.